Why did you decide to join the Global Commission on Pollution and Health? children, the elderly and the poor. Strikingly, more than 90% of pollution-related deaths occur in low-income and middle-income countries. Environmental degradation and human disease are not uniformly distributed around the world. It is the poor, the vulnerable and the disenfranchised – who are the principal victims. to provide science-driven strategies that are proven that in turn leaders can adopt. be won through pollution control. How can we overcome obstacles to progress in the fight against pollution? What changes do you hope to see in your lifetime? I think we have to convince those with the power and influence to act that pollution is very expensive – foremost in terms of pollution-related diseases and premature deaths that in turn are responsible for productivity losses that reduce GDP in low and middle income countries. This negatively impacts a countries’ ability to compete globally and undercuts development. Secondly, I think we need to show those in power that pollution can be prevented – there are science-driven, proven strategies. We need to convince leaders that pollution is NOT the inevitable consequences of development-development that underlies the success of countries at every level of income. In my lifetime, the Commission has suggested several pollution control targets – many of these by 2030, such as significantly reducing household and ambient air pollution, reducing waterborne disease, and reducing contamination at hazardous sites and globally reducing mean blood levels of lead. These are achievable. Thomas C. Chiles received his B.S. in Microbiology and Cell Science in ’83 from the University of Florida; he received his Ph.D. in Biochemistry and Molecular Biology in ’88 from the University of Florida College of Medicine. From ’88 to ’92 he was a post-doctoral fellow at Boston University School of Medicine in the Immunology/Oncology Training Program, as a Ruth L. Kirschstein NRSA fellow. 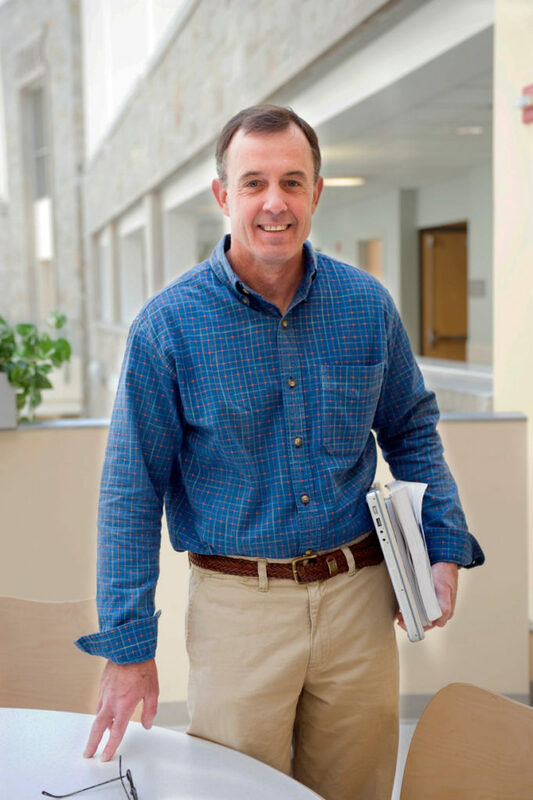 He joined the faculty at Boston College in ’92 as an Assistant Professor. He served as Chair of the Biology Department from ’06 to ’15. Dr. Chiles is currently the DeLuca Professor in Biology and Vice Provost for Research & Academic Planning at Boston College. He has served on several National Institutes of Health study sections, including Hypersensitivity, Autoimmune and Immune-mediated Diseases (’04 to ’08) and currently serves on the Cancer Biology I special emphasis panel at the National Cancer Institute. He has served on numeorus editorial boards, including as Section Editor for the Journal of Immunology. He is a member of the American Association of Immunologists and American Society of Hematologists. He is currently serving on editorial board of Frontiers in Immunology and on the Commission on Pollution, Health and Development in partnership with The Lancet, the Global Alliance on Health and Pollution and the Icahn School of Medicine at Mount Sinai in New York, NY. Dr. Chiles laboratory interrogates cellular physiology and function in B-lymphocytes, specifically the function and regulation of glucose and glutamine metabolism in B lymphocyte growth and survival. His research group is also developing nanoscale and material diagnostic devices for application in biomedical research and clinical settings, such as infectious disease detection in low resource countries around the world.